Our sister company, NTP Health Products has just started importing and distributing Styrian Pumpkin Seed Oil. Delicious tasting and so healthy for you! Styrian Pumpkin Seed Oil P.G.I. (Protected Geographical Indication) uses the best pumpkin seeds that are certified as locally cultivated from Kalsdorf/Ilz in the middle of the wonderful, south-east Styrian region of Austrian hot spring resorts. It is produced in a traditional, mild and sustainable way, without filtering or refining. Thanks to our long established production process, our oil offers an unique, dark green colour and a nutty, gently roasted aroma. The fat of the pumpkin seeds is one of the most valuable vegetable fats with approx. 80 % unsaturated and a whole 50 % polyunsaturated . Our Pumpkin Seed Oil is full of nutrients, particularly vitamins A, B1, B2, B6, C, D and the very important Vitamin E (approx. 29mg in 100 g Pumpkin Seed Oil) as well as different micronutrients. After grinding the seeds in our traditional stone mill, the seeds are mixed with water and salt, gently heated and then carefully processed in our stamp press. One special feature is that the press-worker can adjust the traditional, hand-operated wood burning pan individually for the different pumpkin seeds to guarantee the perfect oil. After this procedure the precious oil is pressed and stored in a cask. We leave our oil to rest for a few days until the suspended solids settle. Finally it is filled into glass bottles or cans. Schalk Mühle KG is a small family business with a long tradition. We have been in the mill business for generations: the mill was first documented in 1542 and in 1859 was bought by Franz Schalk. Our family have been in charge of the business since then. Our current pumpkin seed oil press was built in 1950 and since then we have been producing Styrian Pumpkin Seed Oil. We attach great importance to handcrafting our product as well as ensuring personal contact with our customers and employees. For generations we have tried to strengthen regional, sustainable production and the protection of traditional manufacturing processes by preserving the use of well-established machines. We take steps to support cultural diversity. We use local raw materials, minimal transport, and electricity from our own hydro-electric power plant, as well as firewood from our own forest. 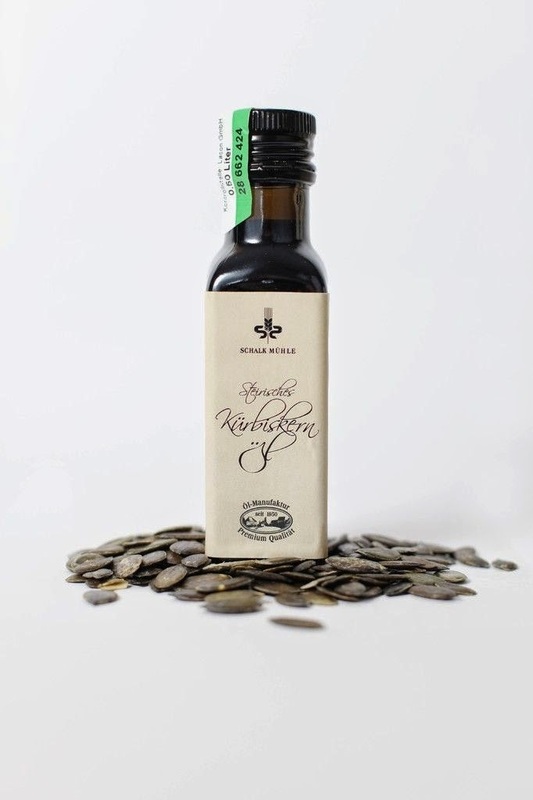 When you buy Styrian Pumpkin Seed Oil from Schalk Mühle you are buying a truly unique, superior quality, authentic and delicious product. This year's garlic crop is in the ground. Two days of hard work last week with six willing workers planting and then mulching the rows. The results are worth it though - come the end of October and it will be time to harvest our crop of juicy garlic bulbs. This year we were blessed with 33 ml of rain after planting which saved us from having to water the beds.